We are a diverse school community providing a nurturing and inviting Montessori environment that ignites joy, wonder and a lifelong love of learning within each child. Guided by the philosophy of Dr. Maria Montessori, who held a deep respect for the child and adult to be, our environment values the human spirit and the development of the whole child. It is our aim to encourage children, partner with parents, and continue to foster growth within the community. Our vision is to continue to provide an authentic Montessori and developmentally appropriate early childhood learning environment, which fosters within each child independence, self-confidence, and a lifelong love of learning. Our educational philosophy is based on the research of Dr. Maria Montessori, who founded the first Montessori school in Rome in 1907. 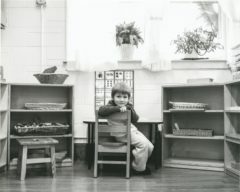 Dr. Montessori believed that the goal of the educational process was to cultivate a child’s natural desire to learn. Our method of education is a child-centered approach. It is a view of the child as one who is naturally eager for knowledge and capable of initiating learning in a supportive, thoughtfully prepared learning environment. Our teachers carefully prepare their environments with Montessori materials presented in an orderly way.